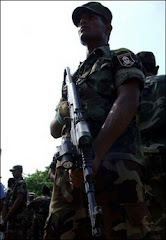 Liberation Tigers of Tamil Eelam is in a ‘death groan’ and counting their days in the restive East of Sri Lanka, when they lost one more camp in the Amparai district yesterday to the Sri Lanka Police Special Task Force. The Police Special Task Force (STF) wrested the control of LTTE’s 'Janak’ camp, situated west of the earlier captured ‘Stanley camp' in Kanchikudichcharu in the Ampara district. The Stanley camp was the biggest base in the Amparai district. Loss of Stanley base and the Janak camp is a huge draw back of the Tigers stronghold in the Eastern province, security sources said. Initially, LTTE cadres fired mortars from the 'Janak' camp at STF personnel deployed around the "Stanley Base" which was captured by the STF on Monday 08 January, according to the military sources. In the battle that ensued, STF on Wednesday morning captured LTTE’s camp called 'Janak' and six other small camps in Kanchjudichcharu, Ampara, killing four LTTE cadres. Two STF personnel sustained minor injuries, a military source said. The capture of ‘Stanley’ and ‘Janak’ camps is a strategic victory that would eliminate the terrorist threat posed to Security Forces camps in the East, said Military spokesman Brigadier Prasad Samarasinghe . According to Media Centre for National Security the STF personnel have found in the captured Janak camp, a considerable stock of STF like uniforms and another stock of STF camouflage cloths and Army camouflage cloths and ten sewing machines – indicating the presence of a LTTE apparel factory. In addition, the stock includes a sniper with night vision, a single eye night vision sniper, one HK LMG and a ‘Gamin’ Global Positioning System. Three trail bikes, one 15KVA Generator were also in the list of items recovered. Two boats with name and logo of the Non Governmental Organization ‘Save the Children’ and two tents with the logo of UNHCR were also recovered from the site.